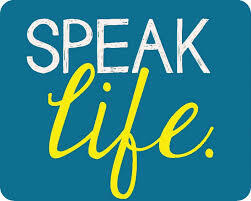 Speak LIFE!! | Reflection of Glory! I don’t know about you, but sometimes I feel like I am at the mercy of a world that only focuses on things that seem to want to drag me down to a state of helplessness, despair, and frustration. Sometimes it is hard for me to listen to the news. Sometimes it is hard for me to listen to the conversation of others. Brothers and Sisters, we are to be in the world – but not let it change and affect who we are. We are to be in the world and we are to change and affect it! We are to change the world because our citizenship is in heaven! We are to be the vessels of Almighty God that bring God’s will upon this earth as it is in heaven! Today, may our thoughts not be focused on things that are intent on bringing us down and making us believe we are less than who we really are. Let’s CHOOSE this day to think upon those things that are God’s best for us and for the world! May we see with the eyes of The Lord what HE sees! May we call forth the treasure that is in each of us…even though our physical eyes may not see it. Think about the Goodness of The Lord…and the Goodness of His creation. May we join Him in calling forth His BEST in His people. Let’s not allow ourselves to be a part of our enemy’s agenda. We do not want to steal, kill, and destroy the destiny and purpose that The Lord has placed within each of us before we were born! Speak LIFE; speak TRUTH; speak JOY; speak PEACE; speak LOVE!! Love you, too, Roxie!! It is hard for us to behave like that at all times. But, it is something that I am working on! !